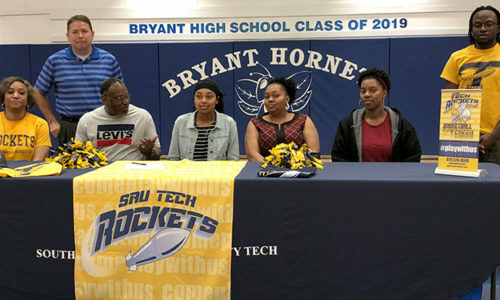 LITTLE ROCK — The Bryant Lady Hornets freshman team had two shots in the final[more] five seconds as they tried to send the game against the Mount St. Mary Mounties to overtime but the proverbial lid was on the basket. The Mounties held on for a 22-20 win at McCauley Center. It was the second time this season the Lady Hornets lost a two-point heartbreaker to Mount. At Bryant, it came in overtime. The Lady Hornets host Conway Blue in their final regular-season game on Monday, Feb. 6. They’ll probably play Mount again on Thursday in the play-in game for the Central Arkansas Junior High Conference Tournament at Bryant. Jayla Anderson led Bryant with 10 points. Nikki Clay and Destiny Huffman added 4 each with Taylor Lindberg finishing with 2. Mount held a 4-0 lead after a quarter but only added a free throw in the second period and Bryant surged to a 7-5 halftime lead. The Lady Hornets increased the margin to 13-9 by the end of the third quarter.